We are prominent manufacturer, supplier and exporter of optimum quality Helical Gears that are used in various industries applications worldwide. These helical gears are appreciated for its perfect finish, rigid construction, high tensile strength and abrasion resisting qualities. These helical gears are manufactured using quality-approved raw material to ensure highly durable outcome at customer's end. These helical gears are fabricated in adherence with industrial set norms and standards. Moreover, customer can avail customization facility form us as per their needs and requirements. We are counted among market leaders in manufacturing, supplying and exporting Helical Gears that are manufactured using qualitative raw material procured from certified suppliers. 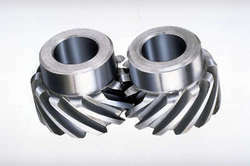 These gears are highly demanded worldwide for their qualitative nature. We manufacture premium quality range of these helical gears at very large scale to meet the high demands worldwide. These gears can also be customized in accordance with customer's given specifications. Looking for Helical Gears ?